Now that I am the grand old age of 23, I feel I should be doing grown up things. Therefore, tomorrow I am having a dinner party. There will be no napkin rings, no candles, no tablecloth… but it will be fun, and I will cook. I’ve decided to cook a few different ‘main’ dishes / sides so that people can help themselves to whichever bits they like, and skip the bits they don’t like. So there won’t be any canapés or appetisers, since I don’t really want my friends to explode in my kitchen. Plus, I fear that serving canapés would make it feel more like a formal dinner party, and I don’t quite feel that grown up yet. 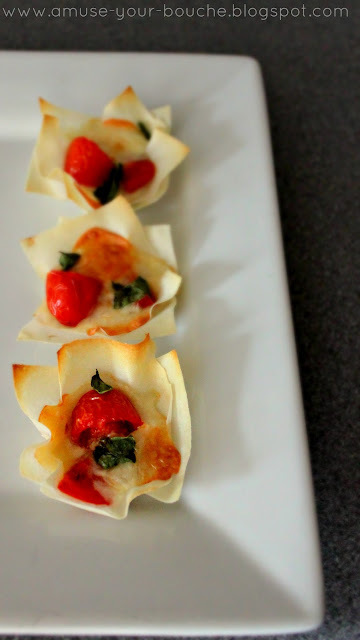 However, I know a lot of grown ups read my blog (how childish do I feel right now), so here’s a great little canapé recipe that you’ll need to make a lot of, because believe me people will want to eat many, many, many of these. 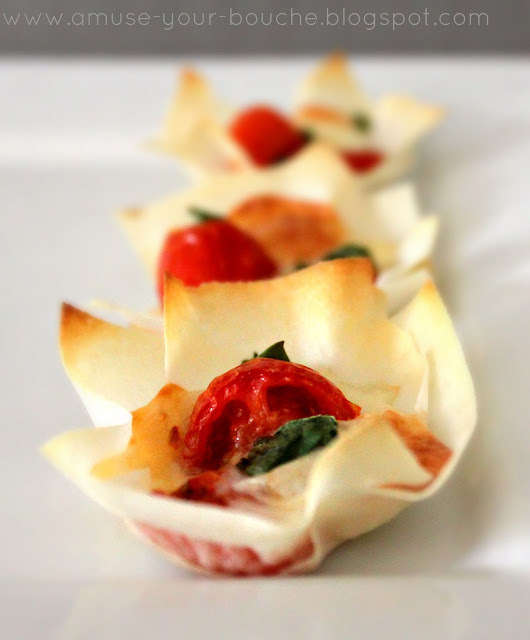 You may have gathered that I love a caprese salad (hence the gooey caprese risotto recipe that I shared last week), and since I had some leftover ingredients I decided to knock up these adorable little pizza cups. 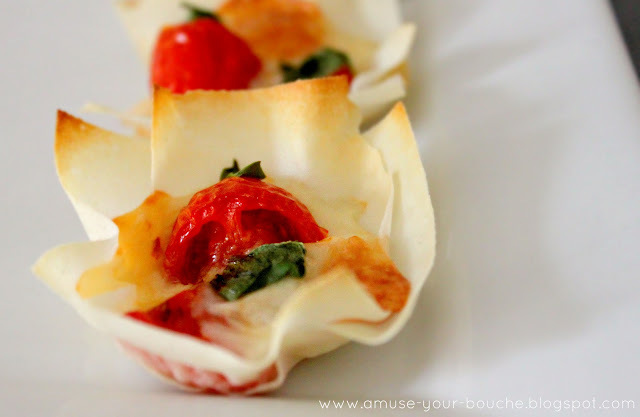 Just create a cup shape with some spring roll wrappers or filo pastry, and fill them with some mozzarella, cherry tomatoes and fresh basil. They’re even better when drizzled with a little balsamic vinegar. Just beware of the crunchy corners of the pastry – they’re sharp! If you wanted to experiment, you could even try making these with different pizza toppings – try adding a black olive, some chopped red pepper or even a small chunk of pineapple. The combinations are endless. Preheat the oven to 200°C (Gas Mark 6 / 400°F) and lightly grease 8 cups of a cupcake tray (spray oil is ideal for this). Cut the pastry into 16 squares, each measuring 2-3 inches. Put two squares together, one at an angle so they form an 8-pointed star. Press this into a cup of the cupcake tray, and press down so it takes the shape of the cup. Repeat with the remaining squares of pastry. In each pastry cup, add a cherry tomato (I halved mine, but you don’t have to), a cube of mozzarella and a fresh basil leaf. Bake for 10-15 minutes, until the pastry is crispy and the cheese is melted and slightly browned. Once cooked, leave in the cupcake tray for a couple of minutes before lifting them out. Stopped by to let you know that I nominated you for the versatile bloggers award. Stop by my website to see how you can nominate the bloggers that you follow and enjoy. This looks and sounds DELICIOUS!!!! I can’t wait until I have fresh tomatoes and basil in the garden for these!